The Sunny Side of Lebanon. | Melissa Tabeek. The Sunny Side of Lebanon. In an effort to catch up on blogging and save some time, I decided to smush all of my tourist weekend excursions in Lebanon into one post. From argiles and kabobs on the beach to boating through massive caves, I’ve seen a lot of beauty but not nearly enough in this country. Part of an old statue. A craftsman from Alexandria, he has been doing this in Lebanon for 15 years, and can make an entire scene in a sand-art bottle in about three minutes. One monkey, some ducks and you got a zoo. Amchit, a Maronite seaside town outside Beirut, is beautiful. But strange. Walking down the hill to the coastline, to the left is the glittering Mediterranean…but turn to the right and a grey factory monstrosity looms. Don’t let it ruin your view though, just turn towards the water and breathe deep. A nice factory monstrosity to enhance the coastal view. Sunday afternoons on the beach. Note to anyone beaching it in Lebanon, in Byblos particularly. Bring your water shoes and watch out for the medical waste. There is a small island off the shore that you can get to. But first you must pick your way over piles of rocks, littered with trash. Syringes. X-rays. Plastic bottles. Etcetera. The path to the island is rife with sharp rocks and moss and in bare feet can be pretty painful. So, after a failed attempt to reach that island, we settled for kabobs on the beach. Perfect afternoons only slightly marred by finding a patch of black oil on the bottom of your foot at the end of the day. Step carefully! Sun and the sand and argile in hand. 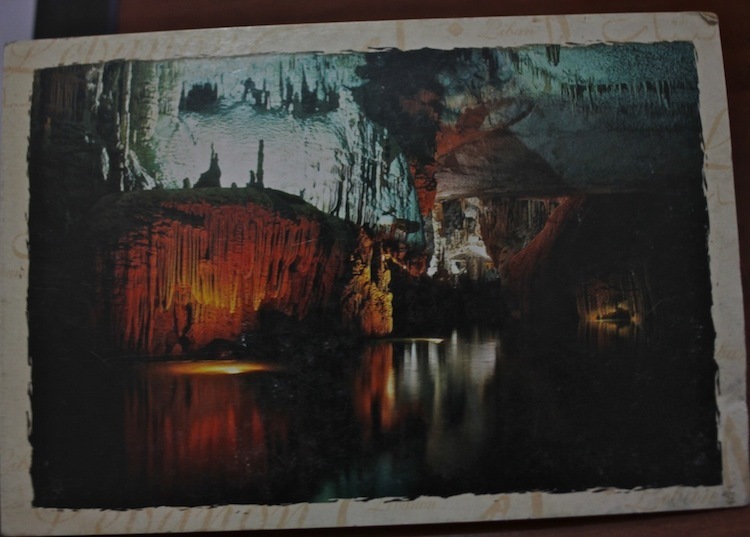 Jeita Grotto – Paleolithic stalactites, mites, underground rivers, oh my! The grotto is made up of two separate and connected caves that span more than 5 and half miles. The lower cave has an underground lake that a guide takes you through on a boat. So long as there aren’t any children on your boat, the ride is incredibly peaceful. The upper grotto can be explored on foot and is massive. Light glances off millions of year-old glittering rocks. I don’t have photos to illustrate the depth and the beauty of these enormous, sparkling, silent and damp caves (no cameras allowed! ), so I included an old postcard I found in box at a souk of the inside of the underground. But I can write that the immense space feels like you are a tiny piece of the world, swallowed up this prehistoric cavern. I have to say that the best light so far has been on my rooftop though. I’m lucky enough to live on the top floor of a building with access to a huge terrace. (Don’t get too jealous, I live in a closet). Many nights, the sunset spreads across the tiles in warm oranges and pinks. Great writing and pictures! As I read the caution on medical waste & walking barefoot, I thought of all the medical waste in this country that ends up in our global oceans. We use once and throw it away.